We’re deep into our 21-Day Primal Challenge; as of today we’re more than two-thirds of the way to the finish line. Based on Mark Sisson’s Primal Blueprint, it’s a lifestyle framework that includes a diet comprised of whole, unprocessed foods, along with plenty of exercise, sleep, sunshine, and play. When it came time to shake things up a bit (in the culinary sense at least) for the new year, this challenge seemed like just the thing to purge the holiday excess (from our kitchen) in a way that wouldn’t take the fun out of our meals. One thing that we both remarked on was that neither of us feels especially different. I’m not sure what we were expecting exactly, but we’re both feeling the same as we usually do, which is to say, pretty good. There are still a few more days to go, but I’m not sure that we’ll see any drastic about-face. So unfortunately, I don’t have any insightful pearls of wisdom to impart; I think I’ll keep going on as I’ve always been – truly enjoying whatever is on my plate, whether that’s a chocolate chip walnut cookie from Levain, a pile of roasted Brussels sprouts. This entry was posted in Uncategorized on January 16, 2014 by Donata. Happy New Year! Here’s hoping that 2014 brings everyone much joy, lots of laughter, and a few adventures. If you’re interested, you’ll find more details on the challenge here. In all honesty, this isn’t far off the way my husband and I already cook and eat at home, but I have to raise my hand and admit to indulging in far too many chocolates, cookies, and a multitude of other tempting treats over the last few weeks. It was fun (and tasty) while it lasted, but I’m feeling a need to break out of that pattern and hit the “reset” button now that the new year is here, and I think committing to a challenge like this is just what we need to keep us honest. I’m looking forward to the next three weeks, and curious to see what, if any, changes we observe in ourselves – physically or otherwise – as a result. I’ll be posting about our experience, and of course, our meals. It’s also been a good excuse to do some menu-planning and recipe-scouting – among my favorite activities. I’ve already started compiling a roster of “primal” dishes, and I’m feeling inspired about the next few weeks. We kicked off the challenge this morning (well, actually this afternoon) with shakshuka – our very own breakfast of champions and a perfect choice to spark our recovery from a New Year’s Day hangover. Shakshuka is a North African creation that nestles eggs inside a hearty and slightly sweet mixture of tomatoes, peppers, and onions, with warm earthy flavors coming from cumin seeds, thyme, and bay leaves. And it’s not just for breakfast – we usually turn to this go-to recipe for dinner at our house. While there are many different versions of this dish, I’m devoted to the one found in Yotam Ottolenghi’s Plenty, and I’ve adjusted the recipe to serve two below. Note: I’ve cut the sugar down from the original recipe, but I didn’t remove it altogether because it helps the vegetables brown. It only amounts to a ½ tsp (about 2 grams) of sugar per person, but you can always omit it if you prefer. In a very large pan (make sure to choose one that has a lid – you’ll need it later), toast the cumin seeds on a high heat for about 2 minutes. Add the oil and onions and sauté for 5 minutes. Add the peppers, sugar, parsley, cilantro, thyme, and bay leaf, and continue cooking on high heat for 5 to 10 minutes, allowing it to color a bit. Add the tomatoes, saffron, cayenne, and some salt and pepper, then reduce the heat to low and cook for 15 minutes. Keep an eye on the pan, and add water as needed so that the mixture retains the consistency of pasta sauce. Taste and adjust seasoning as needed. Remove the bay leaf. Make gaps in the tomato-pepper mixture (one gap per egg), and crack an egg into each gap. Sprinkle with salt, cover the pan with a lid and cook over a very gentle heat for 10 to 12 minutes, or until the eggs are just set. (Note: you can also divide the tomato-pepper mixture into two smaller pans and finish each serving in its own individual pan. Make sure the smaller pans have fitted lids if that’s the case.) Sprinkle with cilantro and serve. This entry was posted in Recipes, Uncategorized and tagged brunch, eggs, healthy, healthy eating, peppers, Primal challenge, shakshuka on January 1, 2014 by Donata. When it’s this cold outside, homemade soup is an easy choice. Last night, I made a chicken soup with ginger, sweet potato, and broccoli. I love the way the ginger infuses the broth in this dish– it smells fantastic and imparts a clean and slightly spicy taste. And it’s quick – everything gets simmered directly in the broth, with a total cooking time of about 15 minutes. It’s also a perfect choice when I need a little break from all the holiday treats that seem to be waiting at every turn this time of year. This dish packs a lot of veggies and helps to restore a bit of balance in the midst of all the cookies and cocktails. Put the sweet potato, carrot, stock and ginger into a large pot and bring to a rolling boil for about 2-3 minutes, then turn down the heat and simmer for 5 additional minutes. Add the chicken pieces and cook for another 5 minutes. Add the broccoli and beans, stir well, season and cook for 3 more minutes. Finish with the fresh cilantro and some lime juice. Taste and adjust seasoning. This entry was posted in Recipes and tagged broccoli, chicken, easy, ginger, Leon, quick, soup, sweet potato on December 12, 2013 by Donata. We’re just a few days away from Thanksgiving, which for most of us probably means a weekend full of food, family, friends, and…. food. Many of us have a roster of food-centered rituals and familiar recipes that we break out at this time of year. I grew up in an Italian family, which means broccoli rabe and homemade focaccia appear alongside the turkey and cranberry sauce on our Thanksgiving table. It definitely ranks as one of my favorite meals of the year, and something I was very excited to share with my now husband when we first got together. Being from England, it wasn’t just a new meal, but a new holiday for him, one that he was excited to learn involved plenty of eating and drinking, along with a four day weekend. Note: The stuffing can be prepared ahead through step 5 and stored in the refrigerator until you’re ready to bake it. Heat the oil in a large pan over medium heat (or use two pans if needed to avoid overcrowding). Add the onion, celery, and parsley and sauté until the onion and celery are soft and translucent. 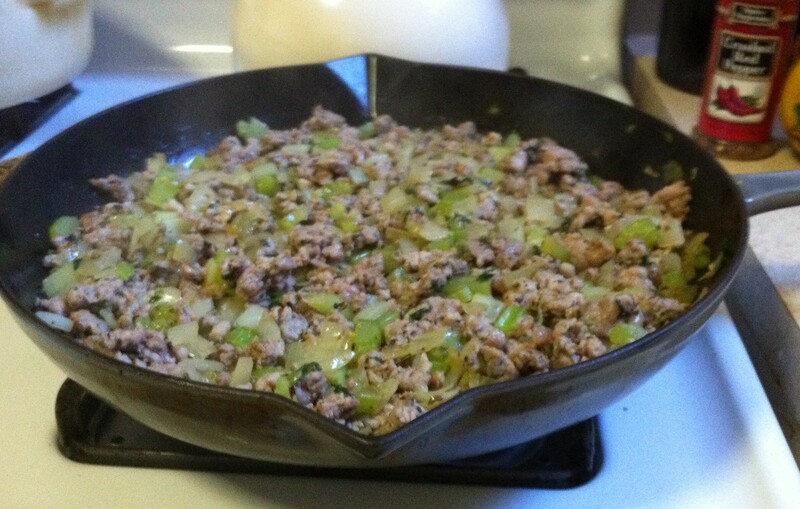 Add the sausage meat to the pan, breaking it up into small pieces with a spatula or wooden spoon as it cooks. At this stage, you can add a couple of pinches of crushed red pepper flakes. 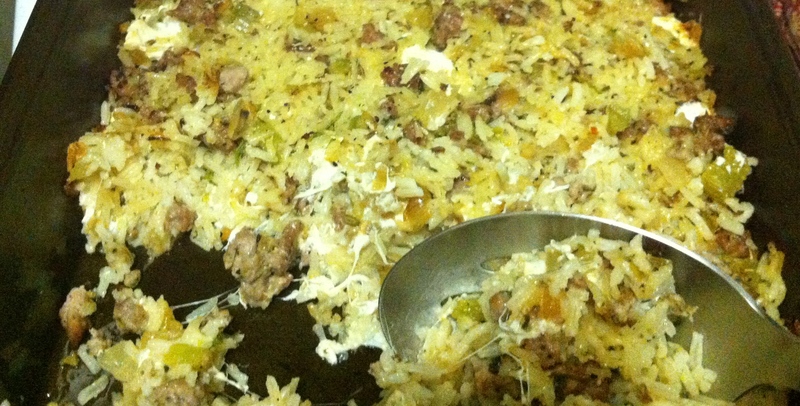 If you’re using unseasoned ground pork, you can also add a pinch of crushed fennel seeds (if you’re using sweet Italian sausage they’ll already be in the mix). Once the sausage is cooked and has started to brown, remove the mixture from the heat and allow it to cool. Meanwhile, cook the rice according to the package instructions. Remove from the heat and allow it to cool. 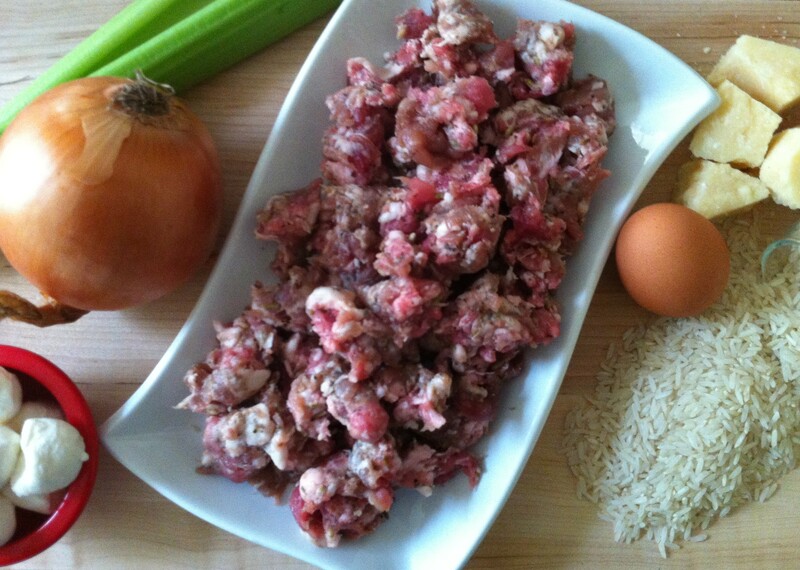 Combine the sausage mixture and rice in a large bowl. Add in the mozzarella, celery leaves, stock, and all but two tablespoons of the Parmiggiano-Reggiano. Taste for seasoning and add salt and pepper as needed, then mix in the beaten eggs until everything is combined. Fill two 9 x 13 baking pans with the stuffing – the pans shouldn’t be filled all the way to the top. Sprinkle the remaining cheese on top. Bake at 350 degrees for 30 minutes, until the cheese is melted and the stuffing is heated through and starting to brown at the edges. Serve with turkey, gravy, cranberry sauce and the rest of your Thanksgiving lineup! 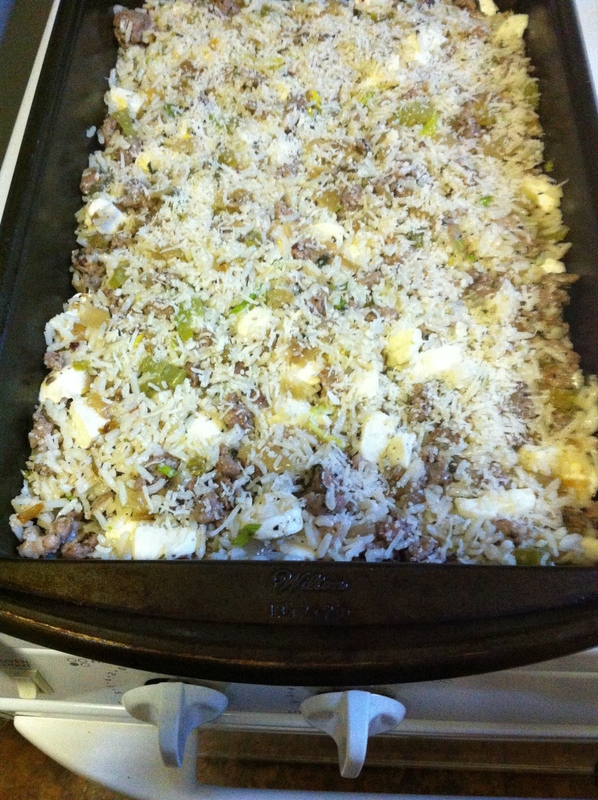 This entry was posted in Recipes and tagged Italian, mozzarella, rice, sausage, stuffing, Thanksgiving, turkey on November 24, 2013 by Donata.